I am in a relationship with an amazingly generous, gentle, funny, socially conscious, caring, reliable and goofy man. He is pictured above. He wore that mask to meet me on a playground and be able to hug me in public. I said I wouldn’t hug in front of my students. I was being weird. He was being funny.OK, so the mask might seem weird to you. To me it was magic. It was about meeting somewhere in the middle, and laughing along the way. We’ve been dating for nearly six months depending on who you ask. We’re traveling across the country together to witness a very important life event on the opposite coast, of one of my very dearest. We didn’t plan it that way. He went and wiggled his way on to every plane we had booked when he found out I was planning that trip on my own. OK, the truth is that I asked him if he’d be interested in joining us. OK, the truth is that I was thrilled when he managed to talk himself into the seat across the aisle from me on every leg of the trip. Marcel thought he was a magician for figuring that out. Sam just looked at us and smiled. He knew it was a good thing on some level, but when you’re the seven year old big brother it is your job to hold back and see. I had to freak internally for about a month after he got the tickets. It was fertile climate for the what if weeds to grow all over my fragile certainty. What if we break up? What if I suddenly have to flee? What if he leaves us for the operator on the other end of the phone? Then what do I do with the guy in the Shrek mask across the aisle? (He offered to wear an Ewok mask actually–in case I needed some space.) Did I mention that he is unflappable? OK, not true. He has an occasional flap. But without them, the plane can’t land. And as high as he is most of the time when it comes to all things Mama C and the Boys, I also appreciate a man who is on solid ground. 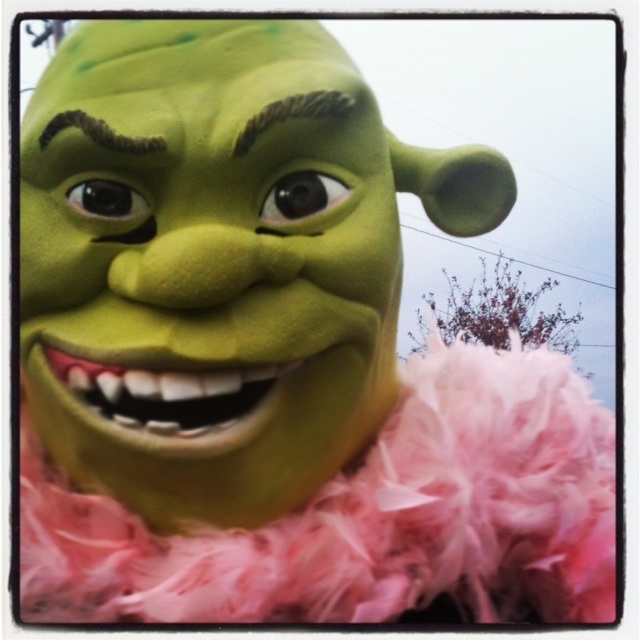 An internet friend has recently written a very provoking post about single parent dating that had me questioning my own choice to include Shrek in my children’s lives from a pretty early on stage. In her post she clearly explains her reasons for not wanting to introduce her son to a partner until a ring is at play. She then goes on to explain her thinking, and ultimately to state that it is a very personal decision, and one that she herself could shift on at some point. I realized that I had many of my own thoughts on the matter too, so perhaps it was time to put them to cursor so to speak. In the past when I had dabbled in a little internet dating I very intentionally did not let the boys meet the folks I was going out with. I did not want to risk their disappointment if things didn’t “work out”. Then I was in a committed relationship for almost a year. It did cause considerable hard spots and confusion for all parties involved as the we’re-no-longer-dating-so-we-can’t-x-y-and-z boundaries were established. Was it confusing when the boys suddenly lost a dear friend? Absolutely. But at least in my view the benefits outweighed the losses. The boys saw me work through a relationship on many layers, and have witnessed different ways to establish clear boundaries, and to practice self care. They were held in their grief, and allowed to voice their feelings about it. In the end, I feel it allows them to have many aspects of relationship modeled–including the losses. They saw my grief, and they saw me enter into a place of readiness to try again. Now that I am in this relationship, they are seeing that life moves and shifts, and that Mama does too. I’m actually quite confident that this relationship has serious longevity potential, as is he. I mean I even changed my Facebook relationship status for the first time in my life. Having raised five kids, in some ways single handedly, Shrek knows kids. Since they are all grown and in their own nests just about (including college) his availability to be with us is tremendous. Because my kids do not have an “other parent” to balance out their time with–it allows them to come to this version of a new family model unencumbered relationally. A donor or a first parent is not at any risk of being displaced by him is what I mean. I did worry about how Uncle would take all of this in–but because he is so secure in his relationship with his nephews–and in the fact that an Uncle is always UNCLE, it seems not to be an issue for him. And all of us talked about that, when questions came up. “Is Uncle still our uncle if you decide to marry one day?” And so on. What am I getting at here? I feel like my relationship with Shrek is not just my relationship with Shrek. He is being welcomed into all of our lives as a part of a larger whole. When the flu hit quite suddenly this week, he was not only willing to buy groceries (and bring flowers) but to make sure no one here was going through it alone. And when Marcel was willing to be left with him, even while still slightly feverish, so I could go leave my sub plan I wasn’t even surprised. When Shrek and Sam spent the day snowboarding last weekend, leaving Marcel and I alone for our own spontaneous adventure to the museum, the bowling alley, and the island walk, it seemed oddly familiar to divide our family this way for the day. When Uncle came to get Marcel from the parking lot at the park when my keys got locked in the trunk (OK, please don’t ask) Shrek and Sam arrived home, put out the dinner in the oven, and texted me every 15 seconds to make sure the locksmith was there, and on task. As much as he wanted to come get me, he stayed with the kids, because it made more sense for their ease and rhythm. Almost daily we hear things like this; “So when you guys marry will we have five new brothers and sisters?” And, “When you guys marry can we bring the rings to you in a canoe or a row boat?” Or “What if Mommy doesn’t know if she wants to put the ring on her finger or her toes?” At first I wanted to disappear when they would bring up that word. Shrek was all about smiling, and answering the questions. Now I take it as the boys trying on more language, more understanding of relationship, courtship, and even marriage.Today when I asked Marcel why he asks me every few hours if we are getting married he said; “Well I think it would be cool to have him as a Daddy. And, he makes you so happy. And I want to be in a married couple.” Would he be beyond crushed if this never happens? I don’t know. I tell them we may not get married all the time. I explain that you don’t leap into a marriage, and that you wait until you are absolutely certain of some things first. So far they have lost interest in the conversation before I have had to answer just what those things are. Because what do I know? Did you catch that dinner in the oven part earlier? Where I wrote that I had made a casserole for our dinner-and it was ready to go? It was my first one ever. Shrek noticed that too. When I got home from the locksmith ordeal he had invited Uncle to join us for dinner and they were at the table playing a game. At the meal we all celebrated safe returns, snow board firsts, museum treasure hunts, and this present and potential way of being a family. This makes me infinitely happy. For all of you. Shrek sound like quite the guy! I love this post. This post reminds me that there are no hard-and-fast rules to this subject. And while I meant what I wrote, that for me, waiting until marriage seemed a certainty and a ring was on the horizon to bring the new guy into my son’s life felt like the best course of action, I see in this post that love has a way of changing one’s “rules” in life. I’m grateful to dear Shrek for being there for you and the boys. Grateful that you guys have found this person to add to your already complete sense of family. And, perhaps, grateful for reminding me that sometimes love and life has rules of its own. I wish I could think of the theme song to SHREK…… All I know is I’m smiling from ear to ear!!!! This makes me so happy for all of you! As a daughter of a single mom for a few years, I remember the dating world through a child’s eyes. What I appreciate is that you are THINKING About this and only introducing them to people you are in serious relationships with. And you always, always keep them first. I can’t say all those things about my mom. These new family moments sounds perfect to me! Yay for Shrek, lol! I feel SOOOO supported by you all. We are being so intentional with the boys–and they feel so seen, cherished, and excited! It’s a joy to share this post. He saw that I posted it, and texted me immediately to ask; “Are you OK? Or freaking?” Talk about knowing me. Long time reader, first time comment (I’m pretty sure). I am not a parent but I would identify with the (basically) throw it all in the pot and mix it up method of single parent dating, if I were. I don’t subscribe to the abstinence until marriage idea either. How can you know someone throughly and not make love to them? Similarly, how can you know that you should be considering marriage if you have never seen your fiance interact with your children? It seems to me it is because my children would be so entirely important to me that I would want my significant other to be highly involved with my kids. I would need to know that they cared for them too. When I first started dating my husband, we were both single parents, my daughter was 7, his girls were 14, 15, and 16, with the 16 year old living with him. It sounds like Shrek is a great guy, I am so glad that the boys like him, it makes a huge difference.